There are different types of web hostings which you can use to put your website on the internet. For the newbie, shared hosting is quite sufficient and it will do most of the work. However, if your website is getting a lot of traffic you need to shift to a powerful dedicated server. Dedicated hosting is the best option for webmasters who get a huge number of visits daily. The webmaster has full control of the server which helps in easy handling of the website and one can optimize the server as per their needs. Although, the dedicated server hosting services are more expensive than the shared hosting and virtual private server hosting, but dedicated server hosting also provides a high-level of security and authorization which helps you to grow your website more flexible. So, if you are looking for a best and fully-manageable dedicated web hosting service for your website then check out the below-mentioned list of top 10 best-dedicated server hosting providers 2016. Obtaining the most reliable and effective dedicated server hosting provider is not a very simple task, especially when your budget of buying dedicated hosting plans is very manageable. This is the main reason, we have created this dedicated server hosting reviews guide to present you some of the most popular and affordable dedicated servers. The first hosting which makes our list of best dedicated server hosting is InMotion hosting. InMotion Hosting is well-known for ultimate power, reliability and performance. InMotion dedicated server hosting offers a variety of plans, and with each play you will get free SSD. You can use the one-click install feature which will install all the famous web applications on your website easily. 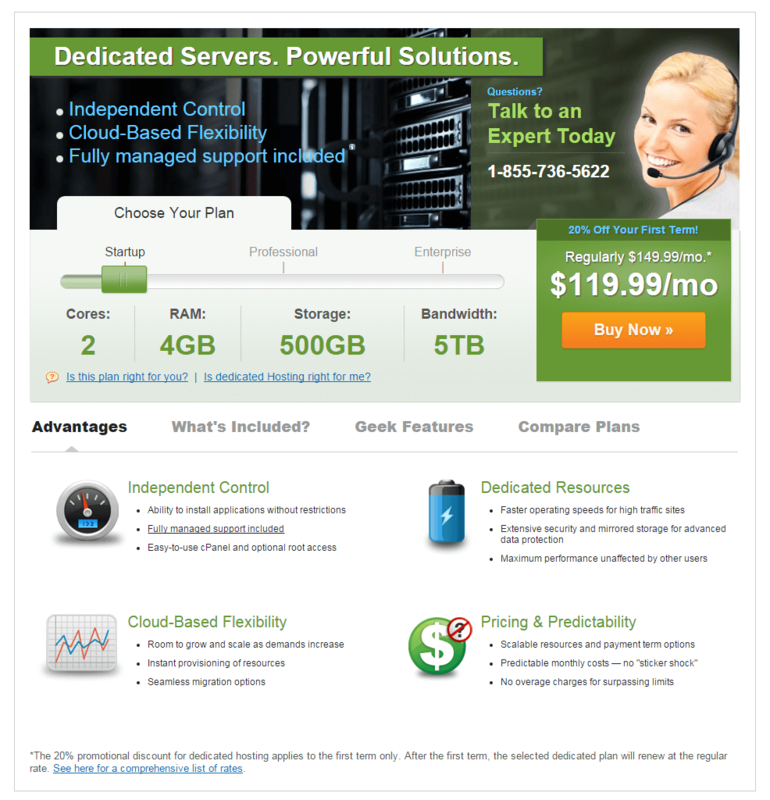 You can get dedicated server only for $79.99 per month. Bluehost is the leaders of web hosting and provides best dedicated server hosting too. 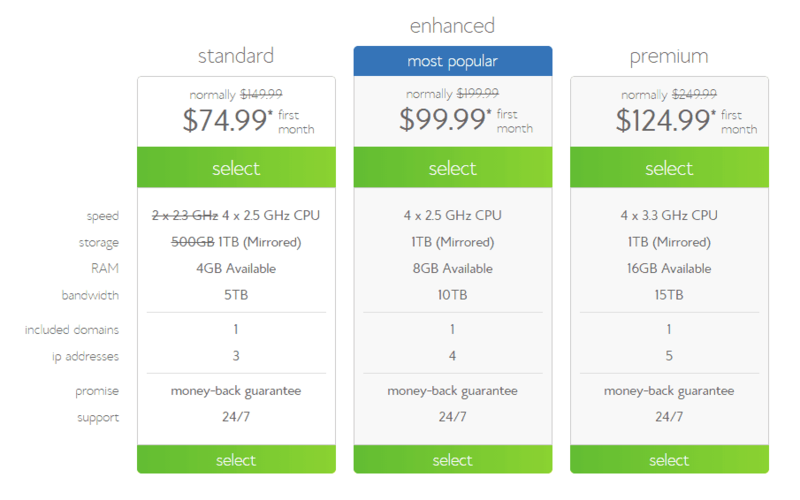 Bluehost provides RAID 1 mirrored storage in all the plans offered by the company. The hardware used in the dedicated servers is latest and is well maintained by Bluehost. 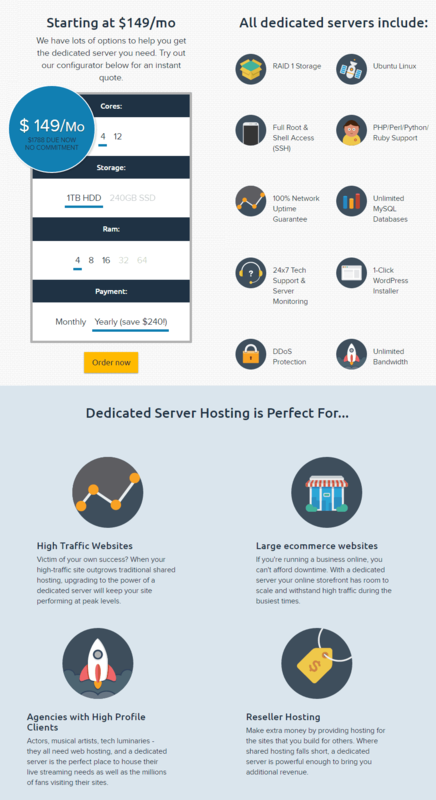 Packages start from $74.99 at Bluehost. If you are looking for a well-manageable dedicated hosting service along with outstanding support, speed and flexibility then Bluehost dedicated server is the most appropriate option for you. The next popular hosting which makes our list of top 10 dedicated server hosting service is iPage. If you are looking for a hosting provider who can manage your server by its own, you need to try iPage. iPage provides fully managed support for the servers. The advanced security along with mirrored storage is the most interesting feature which makes iPage one of the best dedicated server hosting 2016. With MediaTemple dedicated server hosting, the user gets a lot of choices to choose from. 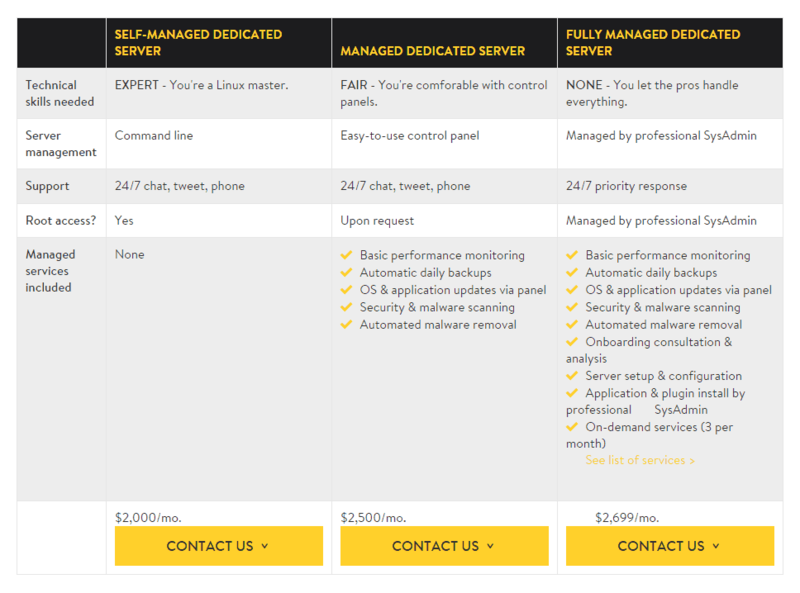 You can select from fully managed, semi-managed of even the self-managed hosting packages offered by MediaTemple. All the dedicated servers provided by MediaTemple come with 1 TB Solid State drive and 128 GB of RAM. Media Temple is a bit costly hosting website as packages start from as low as $2000 per month, but if you want a fully managed dedicated server with high-performance and exclusive features then Media Temple is one of the most suitable options for you. FatCow is the fifth web hosting making to the list of top 10 dedicated server hosting. You get fully managed servers with Fatcow. The cloud-based flexibility & scalability help in the easy running of the websites hosted on the dedicated servers of FatCow. In all the plans, a user gets 3 dedicated IP addresses. FatCow offers a 30-day money back guarantee and packages start from $119. Hostgator is also a well-known name among the hosting providers for offering a reliable dedicated web hosting services and packages. Hostgator not only provides best dedicated web hosting services but also offers verities of the web hosting features that help you to take complete control over your hosting environment. You can easily get started by selecting the Windows server or Linux server according to your web hosting plan. You can store unlimited SQL databases in the servers you buy from Hostgator. If you are new to web hosting and are looking for best dedicated server hosting provider with less complexity, Justhost is the host which you need to try. The cPanel provides you easy access of the server and allows you to manage it easily as per your requirements. JustHost dedicated hosting is designed with cloud technology to provide affordable managed hosting with instant provisioning. 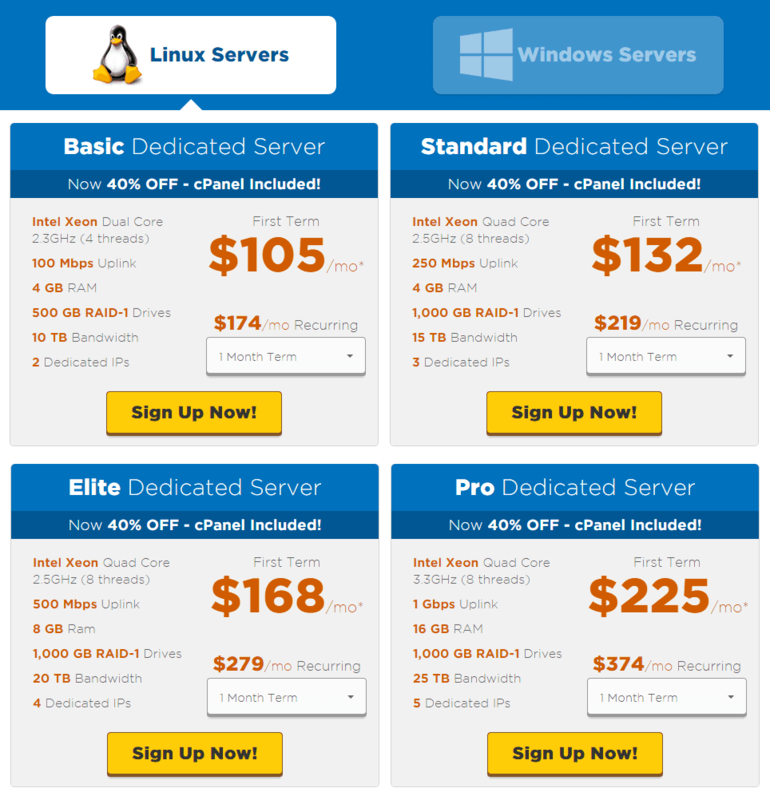 You can easily get started with the Justhost dedicated server packages which start from $74.99. Sign up right now and enjoy a reliable and professional web hosting from Just Host. LiquidWeb is also a well-popular dedicated server hosting provider that offers high-level of managed dedicated server solutions. It provides cheap dedicated server hosting and this web hosting is preferred for people with less budget. The specifications of the dedicated servers which you get with Liquidweb are 1 CPU core, 50 GB solid state drive, and 5 TB monthly data transfer limit. If you want to take benefits of the exclusive Liquid Web services then you must buy a budget dedicated server hosting package from Liquid web. We all know that GoDaddy is the leaders of domain registration, but they are also one of the best dedicated server hosting services in the world. The servers registered on GoDaddy provide high performance and make sure that the website is having 99% uptime. Both plans (Linux web hosting plans and Windows web hosting plans) are pretty much affordable with GoDaddy dedicated server and the good amount of storage & Bandwidth. The last best dedicated server hosting provider is DreamHost. DreamHost is known for the best uptime provided by the servers under the company along with great customer support. You will get full root access and SSH access on Dreamhost. Packages at DreamHost start from $102 per month. DreamHost dedicated server hosting is perfect for high traffic websites, large e-commerce websites, agencies with high profile clients, and reseller hosting etc. So, these are the top 10 best dedicated server hosting providers of 2016 which are ultimate in power, performance, and control. Let us know using the comments section below – which dedicated web hosting service are you planning to use? Good list – I’ve used BlueHost and was happy when I was using their shared hosting, but trying out their VPS and dedicated options was less impressive. I’ve moved to Digital Ocean and have been with them for a while now, great price, great setup and practically no downtime. I found that iPage isn`t for everyone. It`s the best way to start with, but not to run online business… Please, think twice before choosing it as your hosting provider.